Leave it to a Duo from sunny L.A. to heat things up . . .
During last month's Thirsty Thursday Challenge, hosted by the Diva on a Diet at Beach Eats, Chrystal and Amir of The Duo Dishes offered up a victorious beverage with their Pineapple Sage Cocktail. For their winning effort, the toothsome twosome had the privilege of choosing the special ingredient for June's TTC and let's just say they picked a heck of a pickled pepper - jalapeño! When it comes to cocktails, I am BFFs with Sweet and quite friendly with Sour, but Spicy is a near-total stranger. Luckily, Mr. Noodle was unfazed by the prospect of making a so-hot-it's-cool refreshment and with drink glasses polished, jiggers primed and pouring hand flexed, my fearless Tender of the Bar picked up the Duo's gauntlet with nary a blink. Using tequila as the base liquor was an obvious choice, so to toss it up a bit, I suggested we begin with a relaxed interpretation of the assigned ingredient. The jalapeño, originating in Mexico's Veracruz region and arguably the most popular chili pepper in the United States, is just one cultivar of the chili species Capsicum annuum, which spans the heat spectrum from the utterly benign bell pepper to the flamingly combustible Chiltepin. Occupying a sweet spot somewhere between lip-tingling and face-melting on the Scoville Organoleptic Scale (the rather subjective standard test for measuring capsaicin, the compound responsible for chilis' heat) these potent pods make an appealing option for both the spice-challenged, looking for a gateway chili to build up their tastebuds, and the old pros who want to keep theirs primed with a dependably fiery standby. 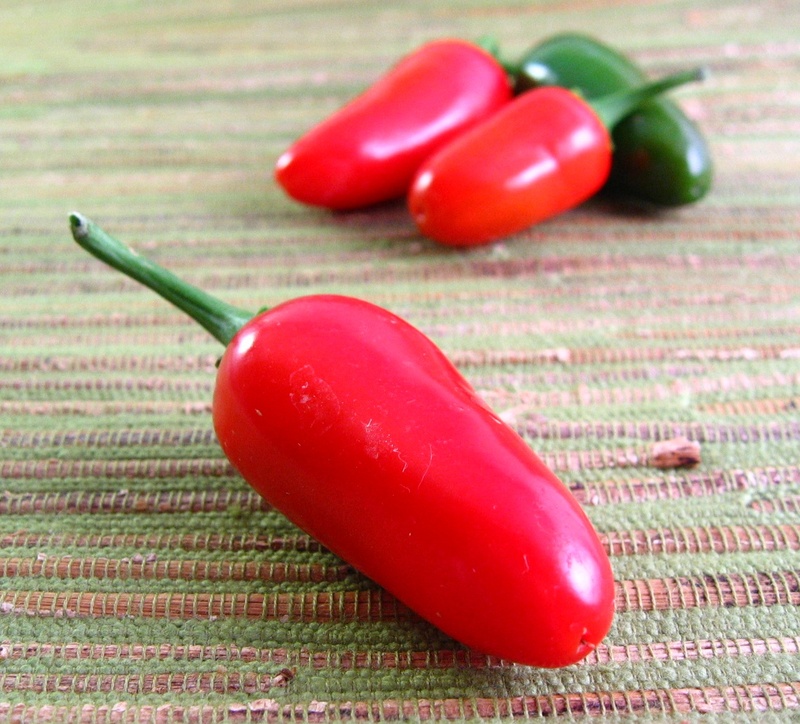 With this little bit about fresh jalapeños, be sure to enjoy their pungent flavor in pico de gallo, as a pepper jelly, or as one of the myriad versions of poppers (stuffed, battered and deep-fried jalapeños) when you get the chance because you won't find them in Team Noodle's concoction today. Still, that's not to say we've violated the rules of the Thirsty Thursday Challenge . . .
What's reddish-brown, shriveled up from lots of smoking but still hot? No, not a sun-worshipping cougar with a pack-a-day habit. I'm talking about chipotles. These earthy-flavored wrinkled forms are smoke-dried jalapeños and are available whole, ground or en adobo (stewed in vinegar, garlic, tomatoes and spices, though there are many variations). Chipotle is one of my favorite seasonings and I often throw a whole pod into stews and soups to add a deep, smoky flavor. When I read that the TTC ingredient for June was jalapeño, I immediately thought of its dried alter ego to use in our favorite drink technique - the liquor infusion. We've gingered gin for Calama-Ginger Sippers and imbued bourbon with rosemary and mint for Bluegrass Iced Tea - now, it's spice time for tequila. To our misfortune, however, I overlooked a small yet critical detail: although it is simply another form of jalapeño, the chipotle is actually hotter than a fresh chili, according to the Scoville scale. This may be due to the use of ripened jalapeños or possibly from the smoking process itself, when the pepper's white pith, where all the capsaicin is stored, breaks down and releases all those burning compounds. Whatever the explanation, we seriously underestimated the power of the smoked 'peño. After soaking a whole chipotle in a glass of tequila for a couple of hours, Mr. Noodle could discern only a slight smokiness. Worried that it would be completely obscured by the other ingredients, I suggested splitting open the pod and letting it steep for another hour. Never again - the resultant spirit was hot. Very hot. Hot as in 'drinking liquid flame'. In other words, it was undrinkably hot. Nursing numbed tongues but much wiser for it, we tried again and this time, I removed the seeds and the remaining pith. To our relief, we finally achieved the earthy flavor and tingly feel that we were hoping for. Back on track, Team Noodle poured, mixed, stirred and sipped until we were satisfied with our entry to this month's Thirsty Thursday Challenge - Jalapeño. Given that we were infusing tequila, a margarita seemed the natural choice for a final drink, closely followed by the idea of a spicy peacharita. Why a peach-flavored cocktail? Quite simply, this luscious stone fruit and piquant chili achieve a perfect taste combination of sweet and spicy, and is already a popular pairing in salsas, barbecue sauces and jams. More importantly, the Noodle bar was short on orange liqueur, an essential margarita ingredient. However, we had plenty of peach schnapps and orange juice - the primary ingredients of the Fuzzy Navel. Through necessary improvisation, we combined the elements of margarita with those of FN, fused them with piquant chipotle and ended up with an icy-hot hybrid beverage worthy of summer's most scorching days and coolest nights. Mr. Noodle said this looked a bit like a petri dish. . . Given our liquid experimentations, I suppose it rather is. Carefully slice open chipotle pod and remove seeds and pith, then steep in tequila for 30 minutes to 1 hour. To increase heat of the drink, leave seeds and pith intact and/or steep for a longer period of time. Strain the chipotle from tequila (reserving the pod for later use in a dish, if you prefer), then mix the liquor with lime juice and peach schnapps. Stir well to combine. In two margarita glasses, pour orange juice to fill the bottom bulb (approximately 1 ounce each). Fill glasses almost to the the rim with crushed ice, then pour equal amounts of the infused tequila mix into each glass. Garnish with orange and lime peels, sprinkle with ground chipotle, if desired, and serve. Thirsty for more? Then check out the Thirsty Thursday Challenge at Beach Eats for additional jalapeño-spiced refreshments! This is seriously one hot cocktail. Tempting to try this. I have all the right ingredients in my pantry. What a great read! I think i know a few "human chipotles" heh heh. And whilst Mr Noodle is right- the overhead shot looks like a petri dish, with some colourful nematodes - the side on shot looks delicious and just the thing for our cold wintery nights right now! I'm a wimp when it comes to spicy foods but would take the heat (puh rum pum)when it's paired with something sweet. A perfect summer drink with Mexican food, mmmm. I think I'd like this cocktail very much! The smoky chipotle flavor in tequila was a great idea. And, the ground chipotle on top looks spicy and exiciting. I want a sip right now! Oh my, I've heard so much about chipotles! This sounds like an awesome combo! Chipotle in a cocktail?! Oh my, this is one fantastic drink. We really need to get busy with some mixology around here. Oh, and I have a secret. I just recently learned that a chipotle is a jalapeno. Ha, ha! I love hot stuff, but my pepper knowledge obviously has room to grow! I would have never dreamed of a chipotle in a cocktail. You certainly used your noodle. Absolutely awesome or should I say you are fearless. The idea of adding Chipotle in a cocktail is very new to me actually. By browsing your beautiful pics, I said to myself, why not give it a try? It looks very tempting. Penny - Give it a go! It's spicy, sweet and refreshing all at the same time. Forager - I've seen quite a few 'chipotles', especially in the summertime when they're quite proud of their tanned, mature figures! 8-P This drink should give you a taste of summer while the chill's upon you. Caroline - Yes, this would pair well with some excellent Mexican dishes. My preference would be tacos lengua - yum! Gera - Thank you! Chipotle is a favorite, so I always have them on hand. Juliana - This was our first time trying chipotle in a drink and we were pleased it turned out so well! Thank you! Pigpigscorner - Peaches and chipotle make such a popular pairing in salsas and bbq sauces that it seemed natural to put them together in a drink. I certainly learned a lot just writing about the chili! Lori - [LOL] You and me - I just assumed it was a different variety, but now I know that smoked versions of other chilis are also called by a different name than from their fresh forms. This is why I love blogging - still so much to learn! Now, get to mixing . . .
Hi Christine! Sorry about that - your comment came in while I was typing . . .! I do hope you give it a try - except for when we left the infusion for too long (and the tequila became too spicy to drink), I was so pleased that spiciness in a cool drink is really quite a treat! This drink looks delicious!! !Beautiful summer cocktail. Phyllis - I became a fan of Simon Pegg with "Shaun of the Dead"! And my tastebuds have healed . . .
Kat - Do be sure to stop by at the Thirsty Thursday Challenge on July 8th when the Diva will post all the jalapeno entries. I'm curious to see what everyone else has done! I'm laughing my head off ... first at the leathery cougar reference ... and then laughing with you over the too-hot infusion. We had a similar experience with our first go-round ... an *extremely* hot fresh jalapeno. Yikes! So glad you kept with it, Team Noodle, because your finished cocktail is truly inspired. I love, LOVE the peach/spice combination. Its a natural! I am so trying this one soon, we have all the ingredients on hand. Can't wait! Thanks again for taking up the challenge in such fine fashion, your pics are amazing too! very cool and gorgeous to look at! That is one hot cocktail! Man, I never thought you could have jalapeno in a drink! Very cool, and double power! My first time here...Im blown away by ur blog..spectacular and what a wonderful variety of recipes to try! Gosh that caught my eye, and I'm hanging in here hoping maybe some day I'll get a glug! Fab post! Love this! Most people think that when the weather is warm, you're not supposed to consume hot and spicy things. But it's actually these things that cause you to sweat thereby helping the body regulate heat better. I'm staring at the pictures and imagining the taste of this fabulous cocktail. Mmmm. That's one beautiful-lookin' drink! Would love a spicy n sweet (and it's peach) drink to beat this summery heat. Thanks for the recipe. I had a jalapeno infused cocktail once and I'll never forget it - in a good way. Chipotles are the best. And if I'm not mistaken, almost all dried chiles are hotter than their fresh counterparts - the removal of water tends to intensify the flavor and heat.